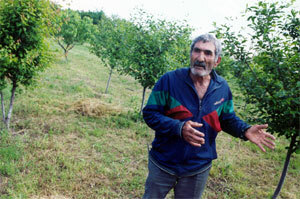 Garnik Maloyan spent and worked most of his life in the Yerevan’s oldest vast fruit gardens and vineyards of Dalma, where for the first time the famous cognac of Armenia was made of the vine growing there. RA Minister of Environment, Vardan Ayvazyan. “Now the government says fruit trees and vines will be cut down as they are going to lay roads and construct buildings on this territory. During Soviet times they at least were taking care of the gardens and it was prohibited to cut down trees. But now all this is destroyed and ruined,” he complains. Statistical information on decrease of the amount of green areas is sufficiently confusing and even contradictory. The 2002 “National report” of the Ministry of Environment of RA shows at least 50% of the city’s green area has been destroyed. Information concerning destruction of the green areas of Yerevan presented by the social-and-ecological association greatly differs from official statistics. 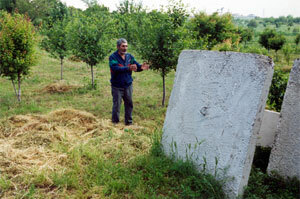 According to the president of association Srbuhi Harutyunyan, in 2004 green areas of Yerevan made 507 hectares. Ecologists insist 40% of the city’s area must be green for having a healthy population. There was a time when Yerevan was close to that but it never reached 40% of green area. And according to head of the working group on Yerevan’s general layout Mikayel Vermishev, now it makes approximately 25%, of which 10%-15% are parks. The breakdown of Yerevan water supply and irrigation systems began during the last years of the Soviet period mainly as a result of lack of investments. However, major destruction of the city’s green areas began in the beginning of 1990s when as a result of the war against neighboring Azerbaijan roads were blocked and it led to a serious fuel crisis. Throughout the winter in conditions of 20 degrees below zero numerous residents of Yerevan had to cut down trees of public parks for heating their apartments. As a result of a new free market economy, building construction volumes have greatly increased within recent years. Business owners are constructing more and more cafés in public parks and green areas. And buildings are growing in the city directly proportional to the decrease of the amount of green areas. Harutyunyan mentioned the law permits construction of recreational zones on the territory of parks and gardens, however, not more than 2-3 cafés can be constructed on the territory of one hectare, meanwhile, their number in many parks reaches 10-15 per one hectare. 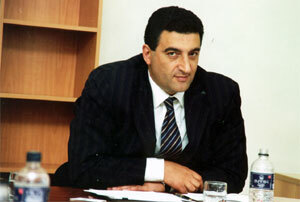 According to Harutyunyan: “The system is seriously corrupted. There are so many cafés that it's hard to believe all of them can gain sufficient profit. Some of them are opened simply for laundering dirty money of the powerful politicians”. Official authorities accept that the situation is serious enough, however, they insist the situation is being recovered. However, when you talk about environment you have to pay attention to another problem. Within recent years residents of Armenian had to fight for the most necessary and basic things such as food, clothes and other things. Even now in conditions of some definite positive improvements in the republic the average annual income of a resident is only $600. Like in many other newly developing countries environmental problems and issues are not of primary importance. Zhora Abekyan, gardener of rented terrotory. However, people’s attitude towards environmental matters is gradually changing. It happened when people tried to protect green areas located in their neighborhood and thanks to their efforts they managed to win small victories. Non-governmental organizations, which every day become more powerful, make the government respond to problems they are concerned about. Moreover, international organizations in their turn demand that the government pay much more attention to environmental issues and problems. Any positive changes and improvement s are too late for Garnik Maloyan. Ironically, responsibility for the problem worrying the gardener partly falls on the biggest donor implementing in Armenia different programs aimed at development including environmental programs, namely on US embassy. Huge territories allotted for constructing the new building of the US embassy are located in front of Maloyan's garden (when finished, the complex will become the biggest US embassy in the world).